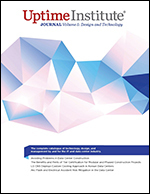 Abstract - Volume 5 of The Uptime Institute Journal, focuses on data center design. Volume 5 examines the range of issues that owners of mission critical facilities need to consider when trying to realize a design. Thought leadership pieces written by Uptime Institute staff examine how modular and phased construction differ, commissioning, and managing the construction process. The authors of these articles focus on data centers that aspire to the highest level of reliability, which means Concurrently Maintainable and Fault Tolerant facilities.